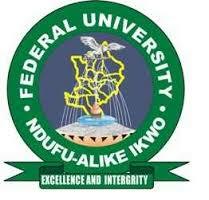 Alex Ekwueme Federal University, Ndufu-Alike, Ikwo (AE-FUNAI) Receives National Universities Commission, NUC Full Accreditation for 26 Academic Programmes. The Result of the accreditation exercise which was released recently by the National Universities Commission (NUC) shows that 26 of the programmes received full accreditation status while Mechanical Engineering and Mechatronics Engineering had interim accreditation. This rare and historic achievement is arguably a first of its kind in the history of Nigerian University system. It is also a bold testament to the commitment and determination of the Nwajiuba’s administration in its drive to reposition the University to meet global academic best practices. The feat is made more poignant taking into cognizance of the fact that 17 of the fully accredited programmes had interim status before the arrival of the Vice-Chancellor in 2016, which means that the programmes would have been closed if not for the extra-ordinary feat.